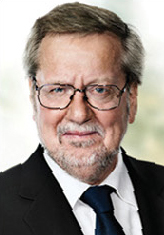 Per Stig Møller is Chairman of the Danish Parliament’s Foreign Affairs Committee and a former Foreign Minister of the Kingdom of Denmark. THE future of Europe is hardly as bright as we would like it to be. It seems to me that the question we need to answer as forthrightly as possible is the following: are we serious enough about our understanding of the problems that lie ahead? Or, put another way, have we been too complacent—because of the last 50 years of peace and success that produced the fall of the Berlin Wall, the enlargement of the EU and NATO, and our continuously rising material circumstances? The first issue we need to examine in this context is the European economy, which is stuck in a sort of coma. Without the euro, no doubt everything would have been worse. Nonetheless, we do not seem able to take the sort of measures that would enable the economy to grow—at least in such a way as to draw sufficiently significant numbers of young people into the workforce. At the same time, there is a big split inside the group of Eurozone countries on economic issues, which have to be sorted out. These problems alone are enough to have created a climate for the rise of political parties in Europe that either want to get out of the EU altogether or seek to stop its development. They have also catalyzed young people to become disillusioned with the European project, which does not appeal as much as in generations past, largely because of the fact that they did not experience the Cold War first hand. By and large, they do not feel engaged in the future of Europe; at best, they feel engaged in the future of their own country—without somehow seeming to realize that the latter depends on the former. How do we create that awareness given these new realities? And how much time do we have before the EU or the euro crashes? If the latter happens, then Europe will go backwards at an extremely rapid rate. Under such circumstances, the voice of Europe will become geopolitically weak. We will be unable to act together when necessary. We will be unable to sanction countries, and we will not be able to take part in important peace processes. Economically, we will endanger the single market and relapse back into an era of unhealthy intra-European competition on, say, tariffs. Technical impediments on imports will also be reintroduced. Virtually nobody has raised this danger in public. Why are we so reticent to do so? Why don’t we say what’s at stake in clear and direct language? How come the European Parliament is silent on this issue? Shouldn’t MEPs be the ones leading the debate both in Brussels and their respective Member States? Instead of focusing on this critical matter, the European Parliament meddles in a lot of matters better left to the Member States themselves. Such an approach, which the Commission has also embraced, only serves to antagonize still more voters. They both ought to keep in mind the fact that the single market is not a social market, as Angela Merkel and the then-President of the European Parliament Martin Schulz, made clear in spring 2014. They should also start to deregulate, as the former Commission promised to do and the new one claims it will undertake.